Performers include: Rachel Bloom, Vincent Rodriguez III, Santino Fontana, Donna Lynne Champlin, Pete Gardner, and Vella Lovell. This musical comedy-drama follows Rebecca Bunch (Rachel Bloom) as she pursues her long-lost first love from summer camp, Josh Chan (Vincent Rodriguez III). It’s been 10 years since Josh dumped Rebecca in high school, believing her to be overdramatic and a little bit crazy. After a chance meeting in New York, Rebecca’s feelings are rekindled when Josh remarks that he wouldn’t have dumped her had he known she would turn out to be so hot and successful. The only problem is that Josh is moving to West Covina, California — a place that’s just two hours from the beach (sometimes four in traffic). In need of a fresh start, Rebecca decides to move there as well — not because of Josh though, as that would be crazy. Josh proves harder to track down than she expected and Rebecca stumbles across Barman Greg (Santino Fontana). Genuinely interested in Rebecca, Greg invites her to a house party. Thinking Josh may be at the gathering, she takes him up on the offer. Much to Rebecca’s disappointment, Josh doesn’t show and he’s rumored to have a girlfriend. Rebecca needs a new plan and recruits Paula (Donna Lynne Champlin) to help her find and woo Josh. After all, his Facebook status is listed as single. Episode #62 — Yes, It’s Really Us Singing: The Crazy Ex-Girlfriend Concert Special! What do you think? Do you like the Crazy Ex-Girlfriend TV show? Do you think it should be ending or renewed for a fifth season? It’s great! I’m a grandmother and I think its hysterical. I wish it had a better time slot, maybe at 9 on a weeknight. I think it would have much better ratings. I hope they have a Season 4 to finish out the series. I love it. 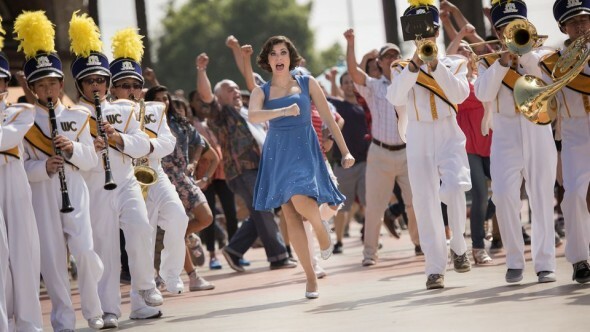 Do not cancel Crazy Ex Girlfriend. This show has so much to offer to entertain! Everything about it is great! keep it on the CW! Love, love, love this show! It is so funny and entertaining…PLEASE RENEW! RENEW!! Love it! So quirky and funny, very refreshing!